An m2eclipse plugin compatible with Maven 3.3 or higher. The screen shots on this page reflect Eclipse Neon (4.6.2) with M2E (Maven Integration for Eclipse) version 1.7.0. If you are using different versions, screens might differ, but the procedures should be the same. The New Project screen opens. 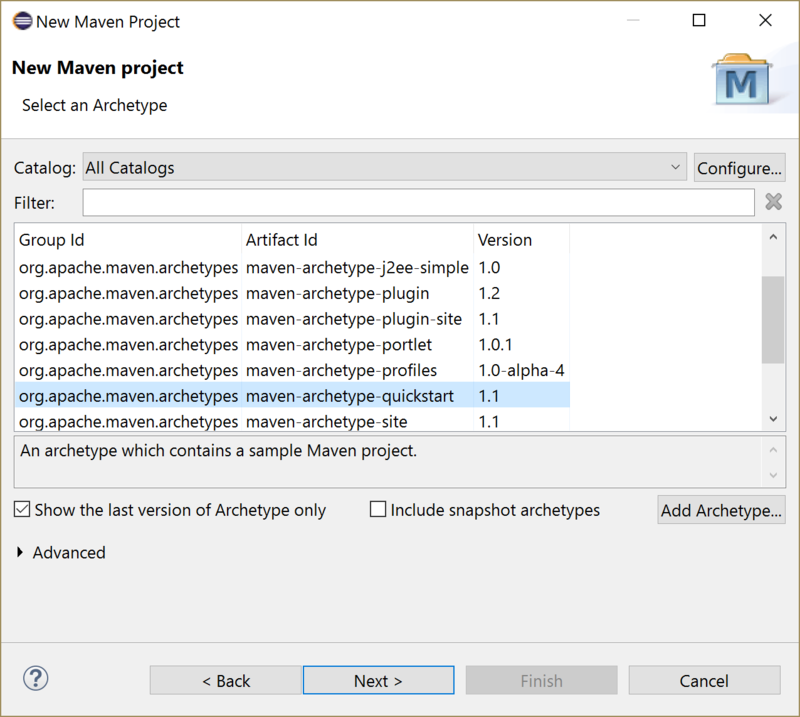 Expand Maven, select Maven Project, and click Next. 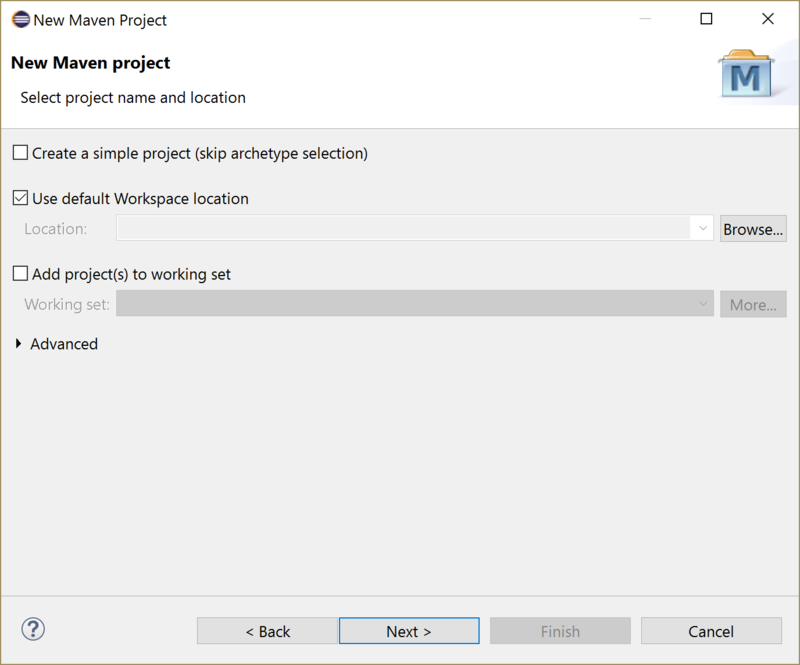 The New Maven project wizard opens. Leave the default, Use default Workspace location box selected and click Next. The Select an archetype page opens. 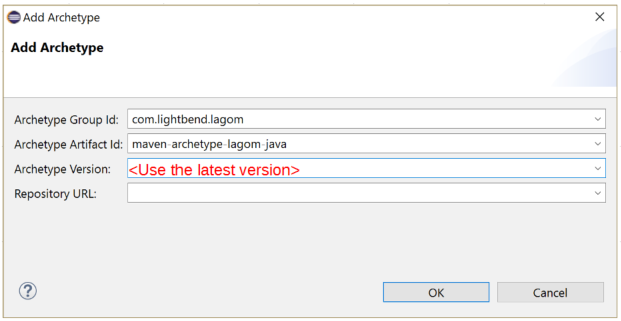 Version: The Lagom version number. Be sure to use the current stable release. The next page of the wizard opens, providing fields to identify the project and displaying the hello and stream properties from the archetype. Group Id - Usually a reversed domain name, such as com.example.hello. Artifact Id - Maven also uses this value as the name for the top-level project folder. You might want to use a value such as my-first-system. Version - A version number for your project. Package - By default, the same as the groupId. Click Finish and the projects created by the archetype display in the Package Explorer. Right-click the parent project folder. Eclipse puts all of the Maven project folders at the same level, so be sure to select the correct one. For example, if you used my-first-system as the Maven artifact ID, right-click my-first-system. Select Run as … > Maven Build. In the Goals field, enter lagom:runAll. Select the JRE tab and make sure it is pointing at a JRE associated with a JDK.